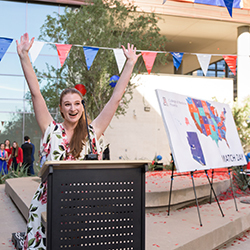 Eleven students received residency placements at the University of Arizona College of Medicine – Phoenix and Tucson programs at Banner University Medical Centers. 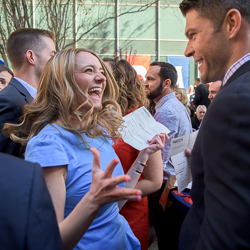 Another 11 students matched with local programs at Phoenix Children’s Hospital, Dignity St. Joseph’s Hospital and Medical Center, Mayo Graduate School of Medicine in Phoenix and Creighton University affiliated hospitals. 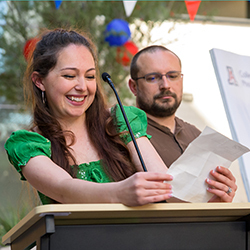 Laura Hamant matched in pediatrics at Phoenix Children’s Hospital, her first choice. She expressed gratitude for the training she received at the UA College of Medicine – Phoenix. 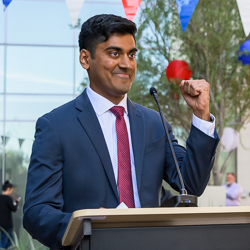 Roshan Panchanathan matched in interventional radiology at Emory University School of Medicine in Georgia. “It feels like all the years, long days and long hours paid off, and I cannot be happier for myself and my classmates,” he said, adding that Match Day, which he had anticipated for four years, surpassed his expectations. Savanah McMahon was looking forward to relaxing a bit before her residency begins in July. She matched in pathology at Yale New Haven Hospital in Connecticut. The UA College of Medicine – Phoenix admits 80 students per class and has graduated 433 MDs. Last year, it received more than 5,900 applications. The medical school’s mission is to prepare its students for the first day of residency and ensure that they will be compassionate physician scientists. Match Day is the culmination of four years of hard work in the classroom and in clinical training. Commencement for the Class of 2019 is at 3:30 p.m. Monday, May 6 at the Orpheum Theatre, 203 W. Adams St., Phoenix. Banner Health President and CEO Peter Fine will deliver the keynote address.